LAS VEGAS, NEV. – Undefeated Mexican phenom Saul “Canelo” Alvarez (36-0-1, 26 KOs) is coming out swinging, this time on the side of countryman Erik “El Terrible” Morales (51-6, 35 KO’s). Alvarezis convincedthat thelegendary Six-Time and Three-Division World Champion Morales will be victorious when he steps into the ring against former World Champion Marcos “El Chino” Maidana (29-2, 27 KO’s) in this Saturday’s HBO Pay-Per-View® main event taking place at the MGM Grand Garden Arena in Las Vegas, Nev. In Saturday’s fight against Maidana, Morales has experience on his side. He is the last man to defeat Manny Pacquiao, and has beaten the likes of Marco Antonio Barrera and Jesus Chavez. 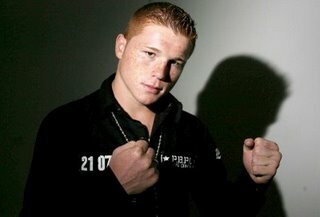 Alvarez, like many, is predicting an “action” packed fight. Boxing’s brightest rising star and newly crowned WBC Super Welterweight World Champion “Canelo” will be ringside to watch his legendary countryman in battle and believes Mexicans everywhere should support Morales Saturday night.